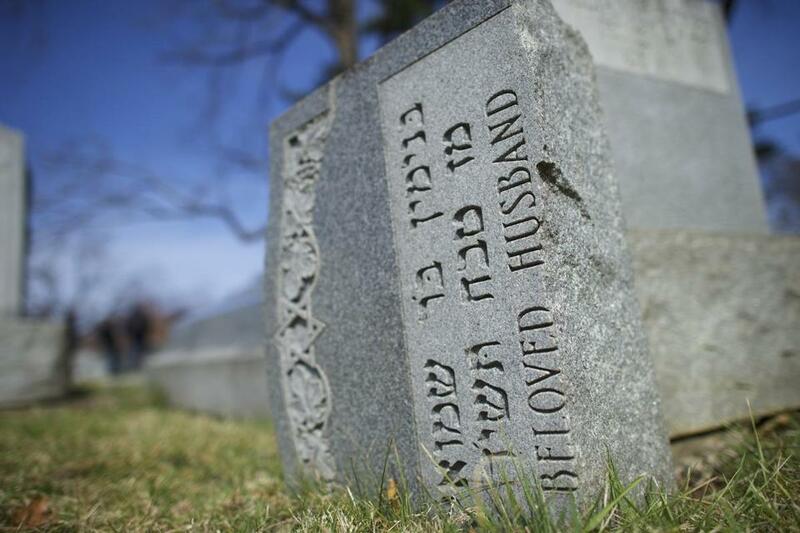 Jewish tombstones lay vandalized last month at Mount Carmel Cemetery in Philadelphia. This weekend, Jews the world over celebrate the festival of Purim, a highlight of which is the public reading of the biblical book of Esther. In 10 fast-moving chapters, it recounts the first recorded attempt at a Jewish genocide. The Persian emperor Ahasuerus (known to historians as Xerxes I) allows himself to be persuaded by Haman, a powerful courtier, that the Jews are a disloyal and disobedient minority who ought to be eradicated. The emperor signs an edict authorizing Haman and his followers “to destroy, to kill, and to annihilate all the Jews, both young and old, women and children, in one day.” But the plot is foiled thanks to court intrigues involving Mordechai, the leader of the Jewish community in the imperial city of Shushan, and the courage and faith of Esther, the young Jewish heroine who becomes Ahasuerus’s queen. On the Jewish calendar, Purim is a joyful day. Families distribute gifts of food, alms are lavished on the poor, children (and even adults) wear costumes — and at every mention of Haman’s name during the reading of Esther, the congregation breaks out in a raucous din of boos and noisemakers. It’s easy to celebrate Purim with hilarity when Jews feel safe and welcome, and in modern times there is nowhere on Earth they have felt safer and more welcome than the United States. Last month, the Pew Research Center released the results of a survey showing Jews to be the most warmly regarded religious group in America. It was Pew’s second such survey in three years, and both times the finding was the same. “We love our country, and America loves us right back,” wrote David Suissa, the publisher of the Los Angeles Jewish Journal, after the Pew numbers came out. Jews, who know only too well what it means to be a hunted minority, have been blessed to find in America a degree of benevolence, respect, and freedom unparalleled in their long and precarious history. But Purim arrives this year amid an alarming surge in anti-Semitic menace. Since January, Jewish community centers and organizations nationwide have been targeted with anonymous bomb threats — at least 140 such threats to date. At Jewish cemeteries in Philadelphia, St. Louis, and Rochester, N.Y., hundreds of gravestones have been toppled or smashed. In Evansville, Ind., a gun was fired through the window of synagogue classroom. During the recent election cycle, Internet trolls from the so-called alt-right unleashed repugnant attacks on Jewish journalists who questioned or criticized the rise of Donald Trump, often suggesting that they prepare to die in a new Holocaust. Equally horrific anti-Semitic eruptions have come from the left, especially on college campuses, where virulent hostility toward Israel often boils over into undisguised hatred of Jews. Thus the paradox: In the nation where Jews are more welcomed than ever, animosity toward Jews is more palpable than ever. To many on the left, the upwelling of anti-Semitic incidents and rhetoric is plainly connected with Republican politics. Trump’s strong appeal to white nationalists, the Jew-baiting memes and tropes that showed up in his ads and social media, and his seeming unwillingness until quite recently to explicitly condemn anti-Semitism — while Trump may harbor no personal ill will toward Jews, he has too often enabled, and pandered to, those who do. To many conservatives, meanwhile, it goes without saying that contemporary anti-Semitism is overwhelmingly a product of the hard left, which seethes with bitterness toward the Jewish state. The anti-Zionist boycott campaign, the Israel “apartheid” slander, the ominous atmosphere in academia — all of it has had the effect of moving bigotry from the fever swamps on the fringe ever closer to the mainstream. Both camps make a legitimate point. Jew-bashers can be found on the left and the right; often it is the only thing they have in common. In our hyperpolarized political atmosphere, it isn’t surprising that anti-Semitism has become one more excuse for partisans to point fingers at each other. But history’s oldest hatred has never been limited to one party or ideology or worldview. A key teaching of the Book of Esther is that once the plague of Jew-hatred gets in the air, almost any environment can nourish it. Another is that Jew-hatred does not subside on its own. It must be confronted, denounced, and defeated. “We love our country, and America loves us right back.” That has been manifestly, wonderfully true for decades, but will it continue to be? Elsewhere, the post-Holocaust taboo on overt Jew-hatred has long since crumbled. Can that now be happening in the United States? Pray this Purim that the answer is no. For if America succumbs to the anti-Semitic derangement, it isn’t only Jews who will suffer.